ILLAPEL, Chile -- Thousands of residents of this small city in northern Chile were sleeping outside Thursday after a powerful earthquake destroyed their homes, a tremor that also forced more than 1 million to evacuate and killed eight people in the quake-prone South American nation. Several coastal towns were flooded from small tsunami waves set off by the late Wednesday quake, which shook the Earth so strongly that rumbles were felt across South America. The magnitude-8.3 quake that hit off northern Chile on Wednesday night lasted for three minutes, causing buildings to sway in the capital, Santiago, and prompting authorities to issue a tsunami warning for the Andean nation's entire Pacific coast. People sought safety in the streets of inland cities, while others along the shore took to their cars to race to higher ground. "I thought it was the end of the world and we were going to die," said teary-eyed Manuel Moya, 38, sleeping with his wife on the ground outside their destroyed home in Illapel, 175 miles (280 kilometers) north of Santiago and 34 miles (55 kilometers) east of the quake's epicenter. The town and surrounding areas have about 35,000 residents. "They said it was a magnitude 8 but it felt like a 10," said Moya, adding that neighbors had brought them clothes. Speaking to the nation late Wednesday, President Michelle Bachelet urged people who had been evacuated to stay on high ground until authorities could fully evaluate the situation. Officials said schools would be closed in most of the country Thursday. In the past year, the nation of 17 million has endured devastating floods in the north, wildfires in the south and two volcano eruptions. "Once again we must confront a powerful blow from nature," said Bachelet. Authorities said eight people had been killed, a number that could climb as emergency crews are able to get into hard-hit areas on Thursday. Mahmud Aleuy, the Interior Ministry's deputy secretary, said 1 million people were forced out of their homes and electrical power was cut off to 240,000 households. Numerous aftershocks, including one at magnitude-7 and four above 6, shook the region after the initial earthquake — the strongest tremor since a powerful quake and tsunami killed hundreds in 2010 and leveled part of the city of Concepcion in south-central Chile. Tsunami advisories were in effect for Hawaii and parts of California. The Pacific Tsunami Warning Center originally issued a tsunami watch for Hawaii but downgraded the alert to an advisory. Tsunami warnings in Chile were lifted early Thursday. Although officials cautioned it was too early to know for sure, it appeared Wednesday's quake had a much smaller impact than the 2010 tremor. 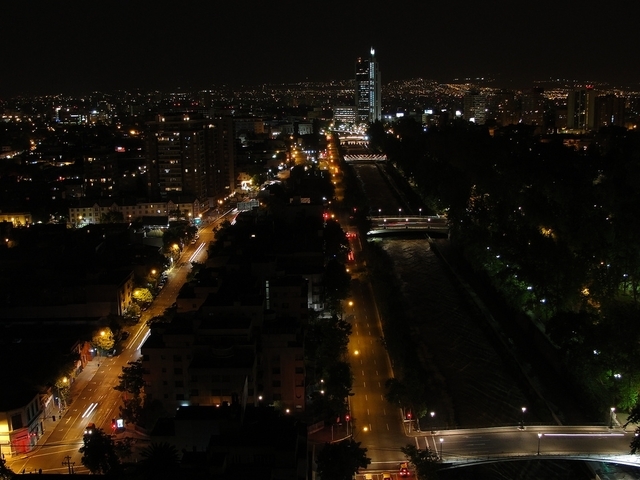 Chile's traditionally strong risk-reduction measures and emergency planning have gotten better in the past five years. "Earthquake impact is a little like real estate: what matters is location, location, location," said Susan Hough, a geophysicist with the U.S. Geological Survey. "But it is true that preparedness and risk reduction in Chile is ahead of that in much of the world, and that makes a difference." The tremor was so strong that people in Buenos Aires, Argentina, on the other side of the continent, felt it. People in Peru and Brazil also reported feeling the shakes. No injuries were reported outside of Chile. Claudio Moreno was in a Santiago bar when the quake hit. The shaking was powerful, but more worrisome was how long it lasted, he said. "We went out in the street when we felt it was going on too long," he said. "It was more than a minute." A magnitude-8.8 quake and ensuing tsunami in south-central Chile in 2010 killed more than 500 people, destroyed 220,000 homes, and washed away docks, riverfronts and seaside resorts. That quake released so much energy it actually it shortened the Earth's day by a fraction of a second by changing the planet's rotation. While Wednesday's tremor was strong by any estimation, the 2010 quake was 5.6 times more powerful in terms of energy released, according to the U.S. Geological Survey. Chile is one of the world's most earthquake-prone countries because just off the coast the Nazca tectonic plate plunges beneath the South American plate, pushing the towering Andes cordillera to ever-higher altitudes. The strongest earthquake ever recorded on Earth happened in Chile — a magnitude-9.5 tremor in 1960 that killed more than 5,000 people. Associated Press writers Eva Vergara and Patricia Luna in Santiago, Debora Rey and Peter Prengaman in Buenos Aires, Argentina, and Seth Borenstein in Washington contributed to this report.